CLIMATE: Mild winter with, hot summer. BEST TIME TO VISIT: Winter, Spring, Fall. COMMENTS: On the southern tip of the Inyos. 2 large new Quanset huts on the site and the road is gated and posted no trespassing. Dolomite was named after the minerals that were mined there. Located at the southern tip of the Inyo Mountains, there are still several buildings standing today, including the saloon. Some current mining activity has been reported. Remaining railroad crossing on the old state highway at Dolomite. 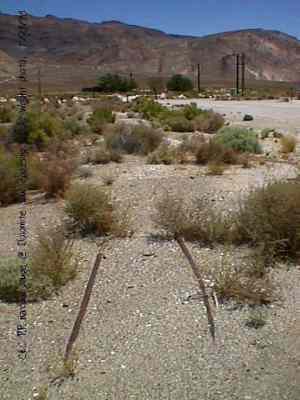 These still embedded rails were part of the Dolomite spur from off the narrow gauge Southern Pacific Owens Valley Branch (ex Carson & Colorado Railroad) and is one of the few places where rails are still found on the abandoned branch (the line was abandoned in May 1960 after nearly 80 years of service). July 1998. View east along the Dolomite spur toward Dolomite. July 1998. 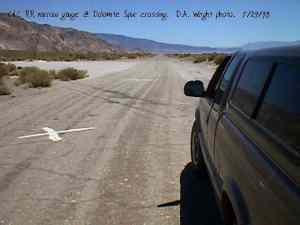 Dolomite spur crossing of the old highway. View northwest toward the Sierra Nevada Range. July 1998. 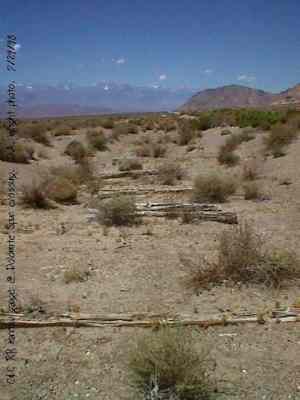 View north along the abandoned Southern Pacific Owens Valley Branch at Dolomite Spur switch. Note elongated ties used at the point where the spur began. Sierra Nevada Range at left and center background. July 1998. 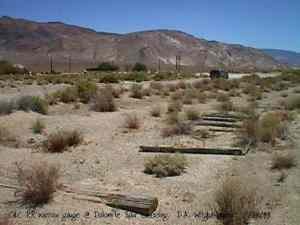 View southeast along the abandoned Southern Pacific Owens Valley Branch at Dolomite Spur switch. Dolmite at left. 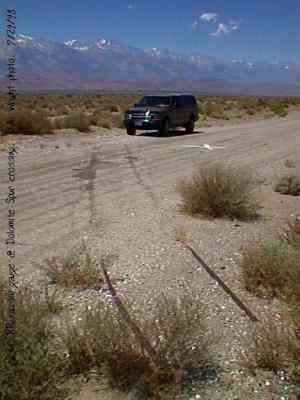 The somber Inyo Range forms the backdrop. July 1998.